Our industry is in a constant state of flux and many companies continue to come in and out of the blogging world. We’ve found blogging to be effective in numerous ways, long before the popularity of social media, content marketing and influencer marketing. The dynamic of being active in the industry and sharing insights as well as lessons learned is essential of a longstanding blog. Along those lines, here are a few insights you may find useful whether you’re just starting a new business blog or evaluating the direction of your current blog. 1. Decide what you stand for and aspire to becoming the best resource for your community on that thing. To many companies try to be all things to all people with their blog, emphasizing a “more is better” approach. Specificity rises to the top in all things – especially in social media, search and the offline world. 2. Document your success in a specialty area and then duplicate that success in others. Expand your scope of knowledge and industry thought leadership following your own lessons learned in the process of becoming “the best answer” for your community. 3. Optimize for answers in your blog content planning. Leverage search keyword data as well as social topic trends for voice of the customer insights you can use in content optimization. You can also monitor questions being asked and answered between customers and your sales and customer service teams. Being the best answer is a continuous effort of understanding the questions your audience is asking and optimizing your answers through content in an info-taining way. 4. Recognize your community by featuring influencers, internal team members, customers, members of the media, your community, or prospective customers in your blog content. Make lists, co-create, do interviews, liveblog and get quotes for blog posts to shine a light on talent. Becoming influential is great. Helping others become influential is how you gain true influence. Show an interest in your community, engage and recognize. Do that, and you will never run out of relevant topics to blog about. 5. Listen to your community through social media monitoring tools, sentiment analysis of blog comments, and contact forms, using social search tools like BuzzSumo and reviewing your own web and search analytics. Understand what your blog community is interested in and give it to them through blog content. 6. Inspire others by actively engaging on social networks, at industry events and in the right places where your community can participate. Social engagement can be overwhelming for many understaffed business blogging departments. Focus on just a few minutes a day consistently and use tools like social media monitoring or social search to uncover opportunities to poll your community, recognize their interactions with your brand and to answer questions – be useful. 7. Use search, social and target audience data to inspire content themes, topics and keyword optimization. Topical relevance is as important as keyword relevance for blog content discovery. Far too many companies focus entirely on content creation without considering blog content promotion. Make sure the blog content is what your community is actively looking for and talking about on the social web. Being relevant in this way will fuel inbound traffic and social sharing, which will attract even more blog traffic. 8. Empathize with your readers and create relevance through context and content that is meaningful. Learn the content preferences of your audience from topics to visuals to what devices they most often use to consume your blog. Go beyond thinking about your blog as a marketing tool and consider what would be the best experience for your readers. 9. Continuously review blog content promotion efforts and traffic sources to optimize performance. Conduct SEO, Content, Social Media and Conversion audits on your blog at least quarterly. With specific goals in mind for your blog, you should be able to tie blog performance back to goals. Performance is not just contribution to marketing, but the ability of your blog to satisfy the information needs of your community. 10. Identify the distinct audiences of your blog and create ways for those specific communities to contribute. Content co-creation can inspire promotion and improve blog quality. Most blogging efforts within companies are understaffed with high expectations. The most effective way to scale quality blog content and promotion is to involve the very community you’re trying to reach in the content creation. 11. Develop a mix of specialty post and recurring posts that allow you to attract new contributors and co-creators as well as a platform for return contributors. Content is a great relationship builder between any constituent audience and your brand whether they contributors are prospective clients, members of industry media or potential business partners. 12. Recognize contributors in a meaningful way. Share quantitative performance as well as qualitative feedback. People will work for a living, but die for recognition – as long as it means something. 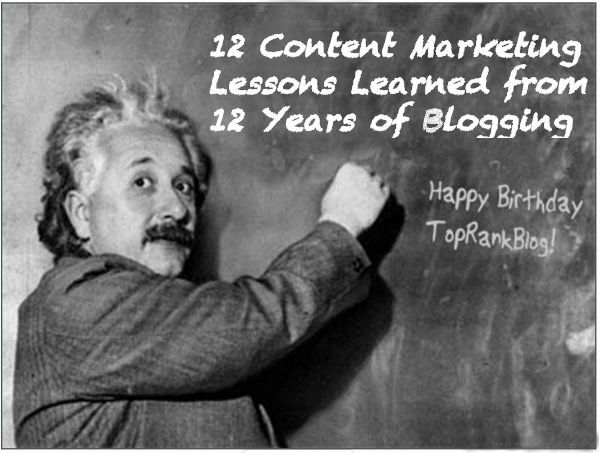 Thank you to our community for being supportive of TopRank’s Online Marketing Blog over the past 12 years. Thank you to the candidates and companies that have taken that important step of following TopRank Marketing’s point of view on marketing through our blog and then engaging as an employee or customer. I can’t tell you how many people have approached me over the years or who have sent letters and emails to say they’ve been reading our blog for years and that it has helped them in their marketing careers. It is very satisfying to know that something like a blog can both help you grow your business but also positively impact your industry. Ashley Zeckman, who has made a huge contribution in 2015 with over 75 posts including the most popular post of the year. This is the first time someone has published more posts than me and it feels great! What does 2016 have in store for TopRank’s Online Marketing Blog? A long overdue re-design, more contributions from the fast growing team at TopRank Marketing and even more useful insight to help our community become smarter and more creative marketers that can achieve real business results. Thank you for reading, sharing, commenting and being a part of our community! While creating great content is good, it is useless until someone finds it. I made a mistake before and I will never do it again. I’m so glad I found this post. First time i am landing on your blog through inbound and congrats for your blog’s great achievement in 2015 with so many shares, I will go through all your top 10 post now to learn information which is useful to my blogging career, I wish you great success in 2016, Happy New Year!.